Posted on November 10, 2006 by Ching under Flickr, Food and Drink. 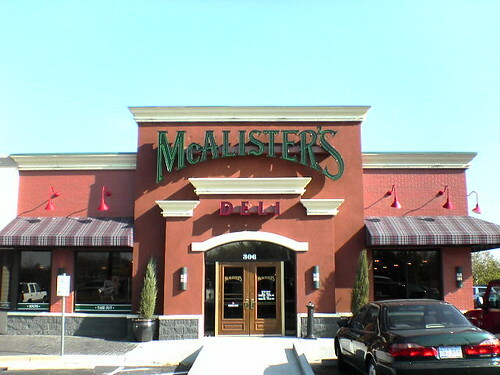 Brian and I finally got to try McAlister’s Deli. Their restaurant reminds me of Jason’s Deli. The prices are about the same. They are located on Rock Road where Hana Cafe and Red Beans used to be. They took over both units and converted it into one. There’s plenty of room inside. Their process is a lot like Jason’s Deli except they have multiple registers instead of only one. The food offerings are pretty similar except Jason’s Deli offers better quality fruit and has a salad bar. Brian also wanted me to mention the free dessert from the autodog. That’s what Brian calls their frosty machine because frosty comes out of the spout like dog poop. I’m not sure if that’s the official name for it but that’s what Brian has always called it. Anyway, our food was good. Brian had the Spud Max and he really liked it. I had a chicken salad wrap just because that is why I usually get everywhere else and that’s how I compare different places. So far the Upper Crust is in the lead. They have the best chicken salad sandwich (and chicken salad period) in Wichita. McAlister’s chicken salad wrap is pretty good too but what I really liked was my Kentucky pie. It’s pecan pie with a scoop of vanilla ice cream covered with whipped cream and drizzed all over with chocolate syrup. It was yummy! Anyway, the place is pretty nice and the food is good. I wouldn’t mind going there again. You all should try McAlister’s Deli if you haven’t already. Posted on November 10, 2006 by Ching under Family, Flickr, Food and Drink. For the first time in years Brian and I are on our own for Thanksgiving (his parents who usually host Thanksgiving will be visiting Aunt Verna in Houston). 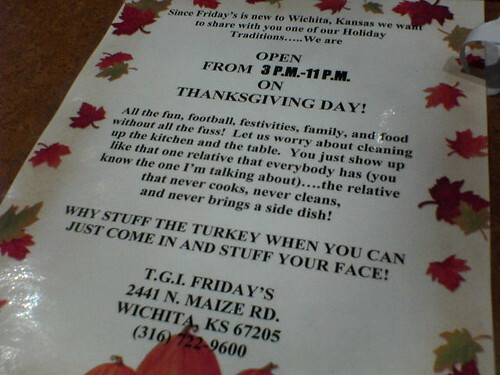 You’d think, having been married for over four years and as old as we are, that we would have plenty of experience hosting Thanksgiving. Sadly, though we thought we were the entertaining type years ago, we realized we don’t like to entertain at all. Thus, our house is often in grave disarray and not in the best form to accept visitors. Posted on November 8, 2006 by Ching under Reviews, School. The character I have selected for this analysis is Gil Grissom. Grissom is the night-shift supervisor of the Clark County, Nevada CSI team. The team works closely with detectives and the county coroner to investigate crimes in the Las Vegas area. Posted on November 8, 2006 by Brian under Life, Movies, Wishlist. 10. Planet of the Apes Saga . I know that they have already made one of the films but I think in the next few years they should remake the rest of them. The original was considered to be a great film with great effects and makeup that was outstanding for its time. It gave us a glimpse of what the world would be like if evolution took a twisted turn. 9. Death Race 2000 . This was, even for its time, a rather cheesy film. It focused around a deadly car race that was considered to be the greatest sport in National History. It was a game that involved racing across specific zones, the more pedestrians you hit the more points you rack up. David Carradine was the bad guy with a grenade for a hand. But this could easily be redone with modern graphics and a perked up story line. Think â€œFast and the Furiousâ€ meets â€œCommandoâ€. Posted on November 5, 2006 by Ching under Babies, Family, Flickr. This is probably one of the most adorable photos I have ever seen. Kudos to Dad for taking it. 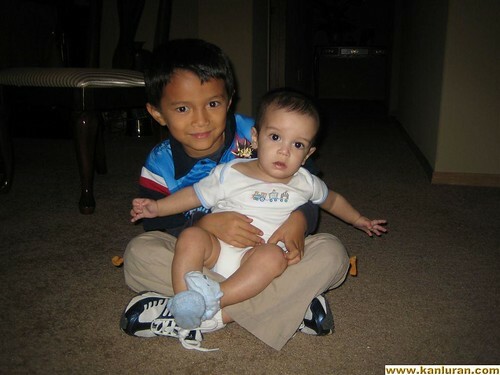 These are our nephews. The big boy is Logan. The little one is Eli. Logan has a special blog here. Eli has a family web site at Baby Homepages.